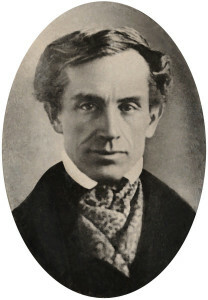 Samuel Finley Breese Morse embarked on a career as a painter and received acclaim in this field, but little monetary reward. He turned to invention, and in the 1830s designed the first truly practical telegraph. He successfully commercialized the invention beginning on May 24, 1844, with a spectacular demonstration in which he sent the question “What hath God wrought?” over some 40 miles of wire from the main chamber of the U.S. Supreme Court in Washington to Alfred Vail in Baltimore. Morse also invented the Morse Code (in 1838), which was for well over a century a major means of communication both by wired and wireless systems.